In response to a dire need for more information about myocarditis, an inflammatory response that attacks the heart muscle leading to cardiac dysfunction and heart failure, the Myocarditis Foundation is dedicated to getting you the facts! Browse the following research photos and descriptions to improve your knowledge of this under diagnosed disease. Complement (C3) deposition in the heart of a mouse with myocarditis stains green. High staining area is the pericardium. Complement and autoantibodies (called immune complexes) deposit in the heart during myocarditis causing cardiac dysfunction. 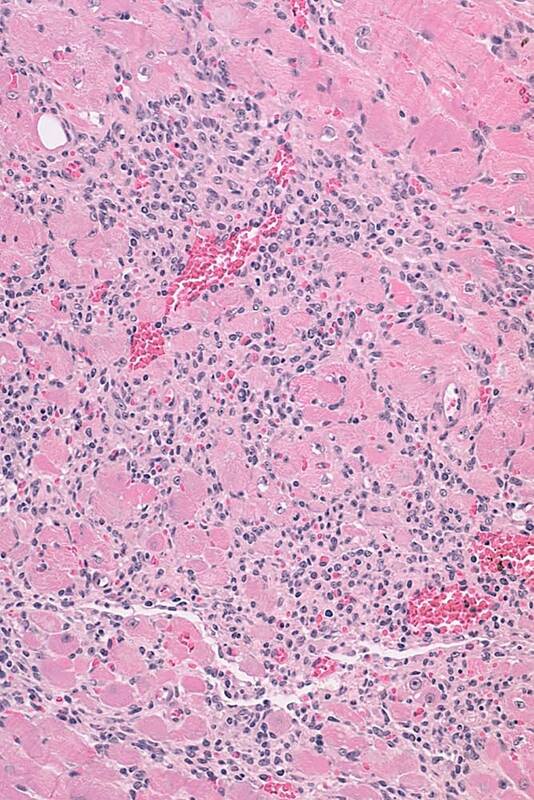 Eosinophilic myocarditis in a mouse. Cardiac muscle is pink, inflammatory cells stain dark purple. 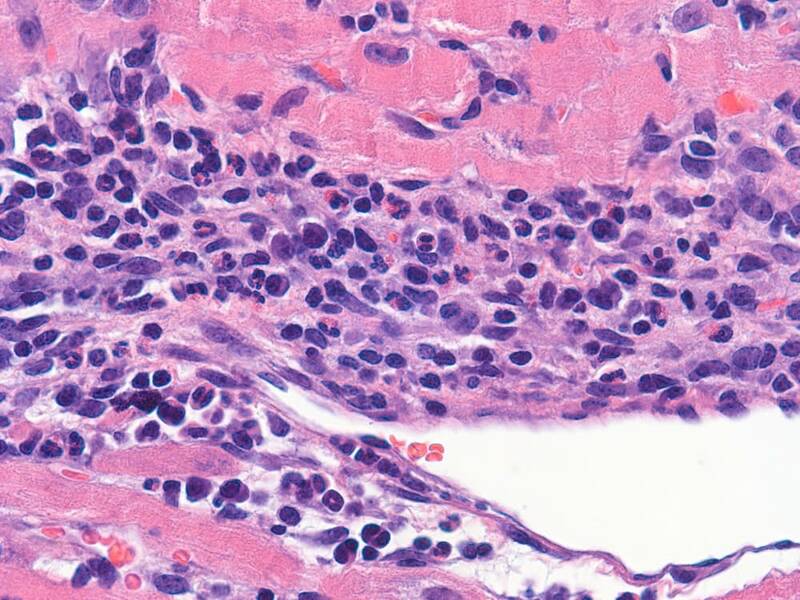 Eosinophils are inflammatory cells with a donut-shape and a bright pink center. 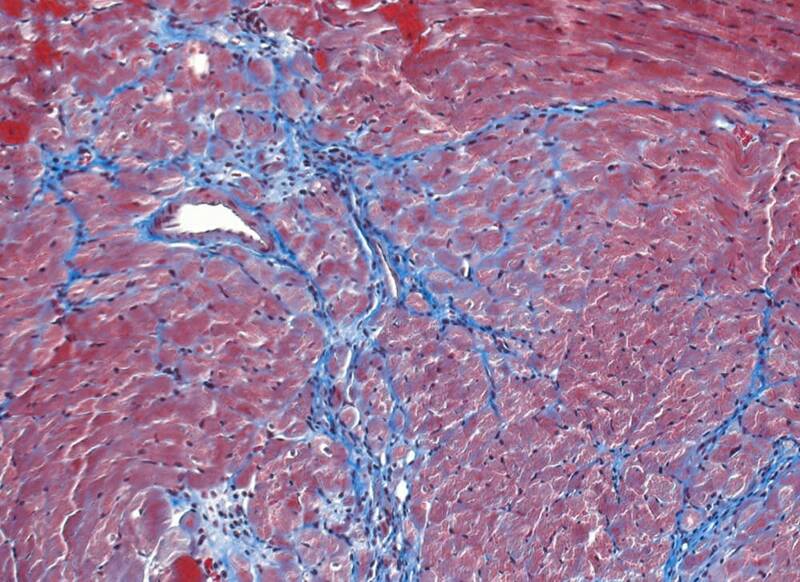 Fibrosis in a mouse heart with chronic myocarditis. 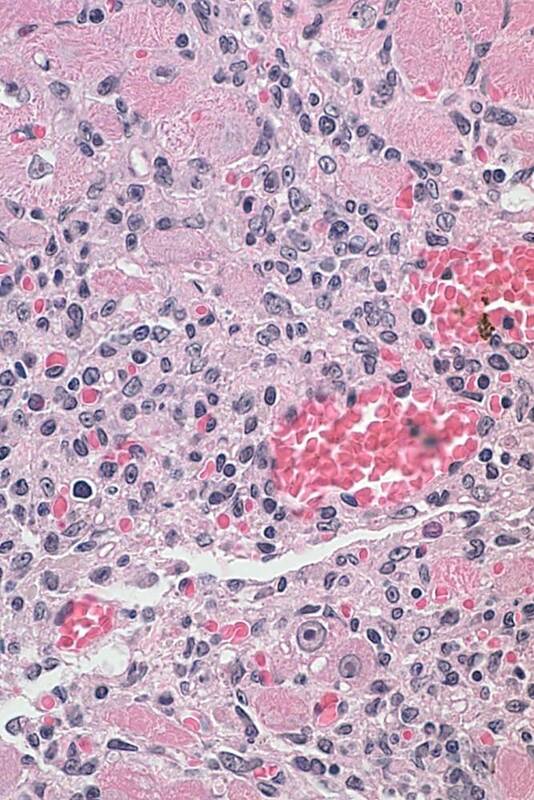 Fibrosis (e.g. 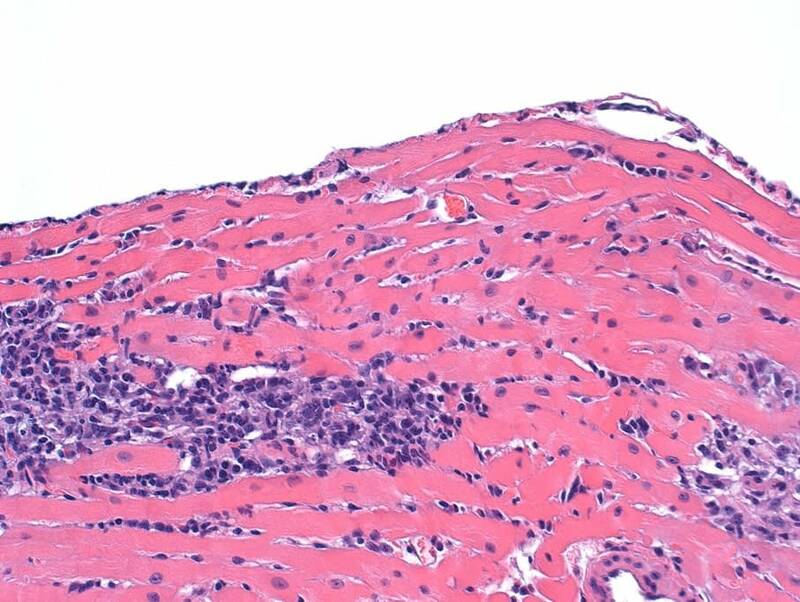 scaring of the myocardium) stains bright blue and cardiac tissue stains deep pink. Scarring of the myocardium leads to dilated cardiomyopathy or an enlarged heart, which places an individual at risk for heart failure. Myocarditis in a mouse heart. Cardiac tissue is pink, cardiac inflammation stains purple. Myocarditis in a mouse heart. Cardiac tissue stains pink, while cardiac inflammation stains purple. Vessels containing red blood cells stain bright pink. Pericarditis (outer layer of the heart) in a mouse heart. 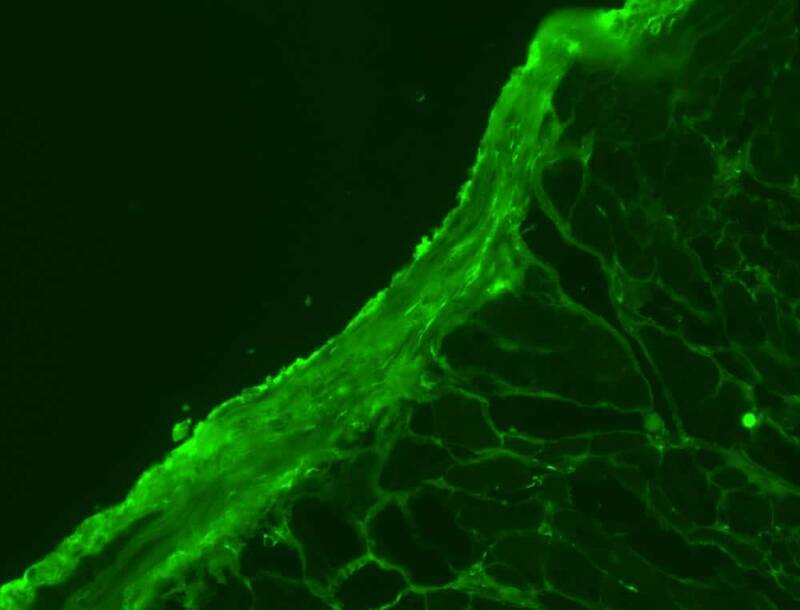 Normal cardiac tissue stains bright pink. Flakey outer layers are pericarditis. Pericarditis alone or with myocarditis (perimyocarditis) can cause cardiac dysfunction. 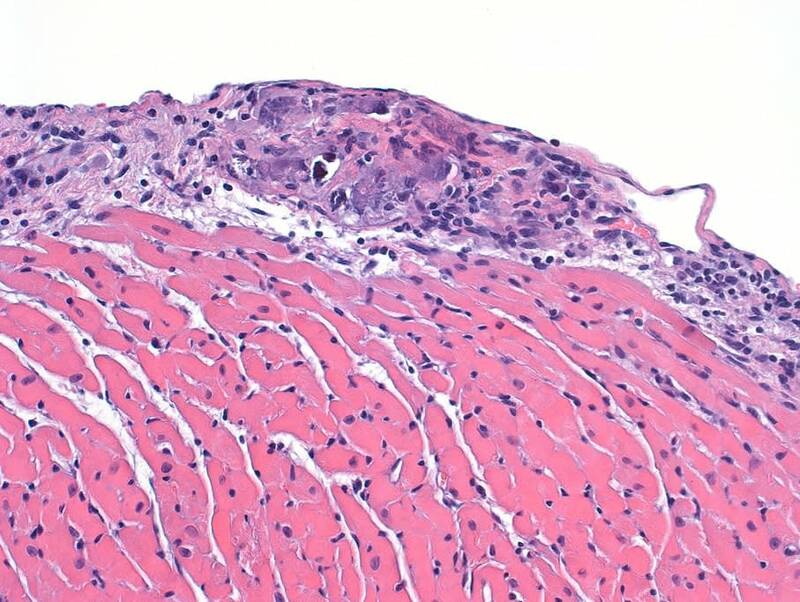 Perimyocarditis in a mouse heart. 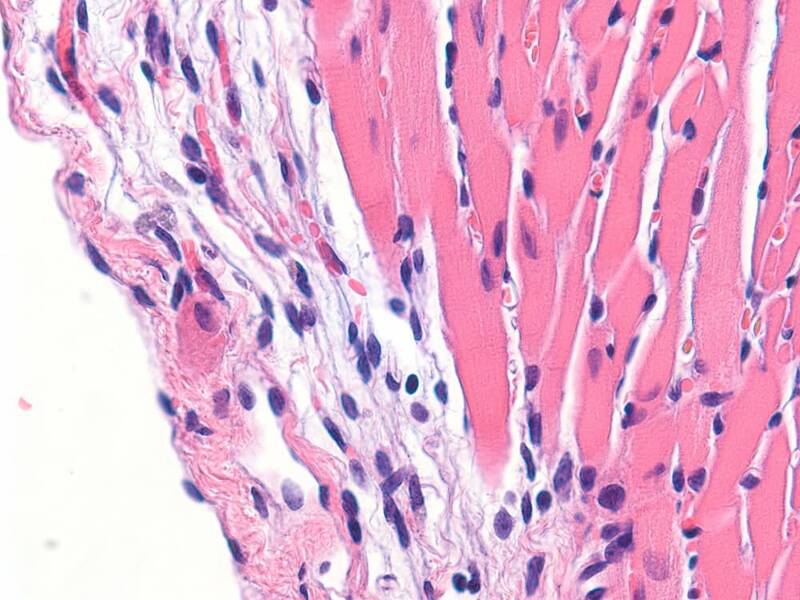 Normal cardiac tissue is bright pink. Purple cell layer on the outer edge of the heart is inflammation (i.e. perimyocarditis). Pericarditis alone or with myocarditis (perimyocarditis) can cause cardiac dysfunction. Pericarditis (outer layer of the heart) in a mouse heart. 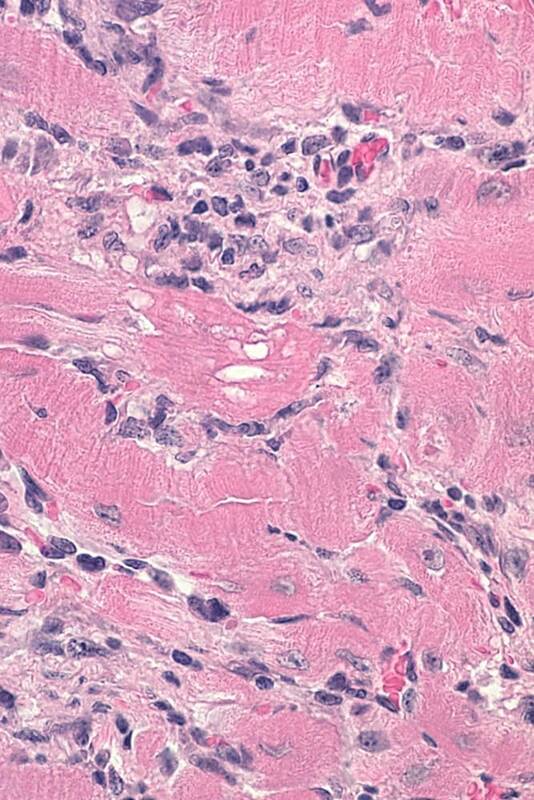 Normal cardiac tissue is bright pink. Purple outer layer is pericarditis. Pericarditis alone or with myocarditis (perimyocarditis) can cause cardiac dysfunction. Want to learn more? 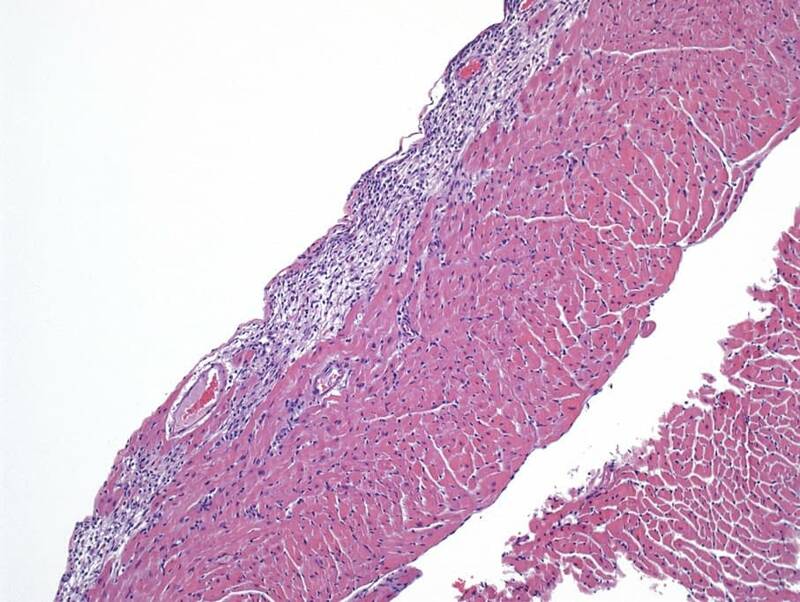 Browse myocarditis FAQs and research articles!